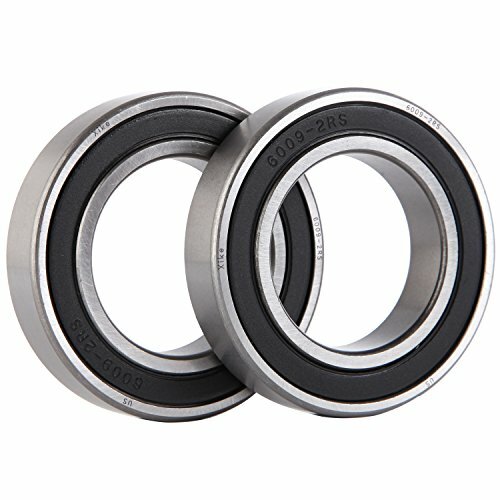 XiKe 2 Pack 6009-2RS Bearings 45x75x16mm, Stable Performance and Cost-Effective, Double Seal and Pre-Lubricated, Deep Groove Ball Bearings. XiKe Bearings USA is the only shop with united states XiKe brand license. We sales high-quality Bearings, Pillow block, Repair kits, Steel balls and other related parts, can provide professional selection guidance, technical information and maintenance knowledge and so on. Grease filled: Standard fill - Temperature range -20 ~ 120 Degrees Celsius. Manufacturing standards: American Bearing Manufacturers Association, Precision ABEC-1. Type: Bearing - Ball bearings - Deep groove ball bearings - Single row - Double seal. 2RS Double seal - For occasions where the external environment is poor and the temperature is moderate (-20 ~ 90 Degrees Celsius). ZZ Dust cover - For the external environment is good, high temperature occasions (-20 ~ 110 Degrees Celsius). Deep groove ball bearings have deep, uninterrupted raceway grooves. these raceway grooves have a close osculation with the balls, enabling the bearings to accommodate radial loads and axial loads in both directions. Deep groove ball bearings are available open or capped (with seals or Shield). LOCATION - Standard Bearings, Cost-Effective the Best and Stable Performance. QUALITY - 100% Dimensional Tolerance Detection to Ensure Optimum Suitability. SEAL - Double Seal Effectively Saves Grease and Prevent Impurities From Entering. IMPROVE - Internal Clearance Slightly Larger, Compensate for Thermal Expansion. PROFESSIONAL - For Bearings We Are a Professional Level, Beginning in 1945. View More In Power Transmission Products. If you have any questions about this product by XiKe, contact us by completing and submitting the form below. If you are looking for a specif part number, please include it with your message. XiKe 10 Pack 608-2RS Precision Bearings 8x22x7mm, Rotate Quiet High Speed and Durable, Double Seal and Pre-Lubricated, Deep Groove Ball Bearings. XiKe 2 Pack 6010-2RS Bearings 50x80x16mm, Stable Performance and Cost-Effective, Double Seal and Pre-Lubricated, Deep Groove Ball Bearings. XiKe 10 Pack 627ZZ Precision Bearings 7x22x7mm, Rotate Quiet High Speed and Durable, Double Shield and Pre-Lubricated, Deep Groove Ball Bearings. XiKe 2 Pack 6308-2RS Bearings 40x90x23mm, Stable Performance and Cost-Effective, Double Seal and Pre-Lubricated, Deep Groove Ball Bearings. XiKe 4 Pack 6206-2RS Precision Bearings 30x62x16mm, Rotate Quiet High Speed and Durable, Double Seal and Pre-Lubricated, Deep Groove Ball Bearings. XiKe 10 Pack 623ZZ Precision Bearings 3x10x4mm, Rotate Quiet High Speed and Durable, Double Shield and Pre-Lubricated, Deep Groove Ball Bearings.